Language Arts General - In this section you will find citation and bibliography sources, digital storytelling, Novels and Classical resources, reading passages, analogies links, reading ability links, and general language arts resources. Language Arts Elementary - Our elementary Language Arts and reading section contains links for reading comprehension passages and worksheets, Dolch word lists and activities,idioms, novel guides, phonics help, literacture guides and other elementary based Language Arts resources. Language Arts Middle & High School Find bibliography and citation information, comic strips, grammar, homonyms and homophones, interactive lessons, novel and chapter book resources, poetry, root words, story elements, reading passages and vocabulary enrichment. Language Arts Stories - Online stories for children to hear and read can be found in this section. These stories include picture book stories, Peter Rabbit, bedtime stories and Aesop's Fables for younger students and audio and classical novels for older students. Language Arts Writing - Find writing resources for all types of essays, including expository, narrative, and persuasive. Analogy help, transition words, prewriting, creative writing lesson plans, and writing prompts can also be found on this web page. For Reading and Language Arts activities to prepare for testing, visit our Assessment Assistance Pages. 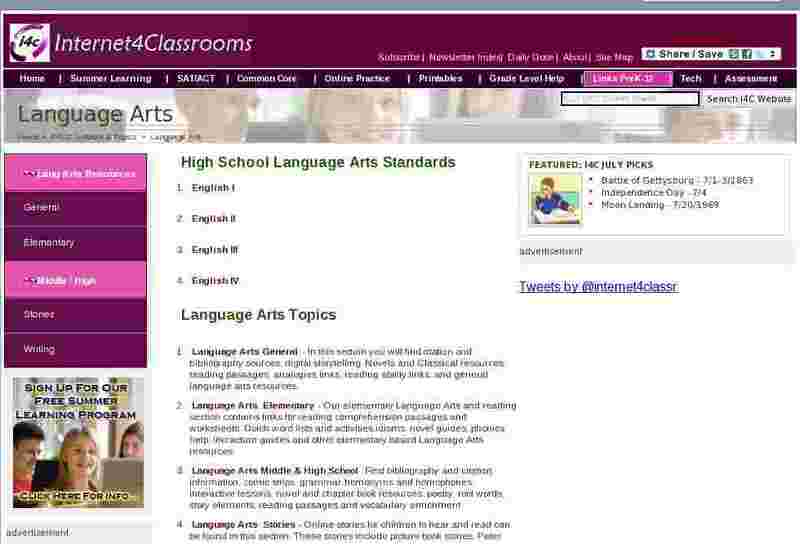 For Language Arts and Reading activities by grade level, visit our Grade Level Practice Pages.